I have profited from George Barna’s books that have dealt with statistics and polls concerning the church in this decade. That is obviously his field. 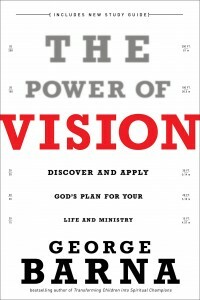 Barna made an attempt with this book to deal with the topic of vision from a biblical perspective but, I think, unsuccessfully. Actually the book comes from more of a business perspective than from a biblical ministry perspective. Few scriptures were even included and those were just to gain a verbal effect. On the opening page Barna quoted Prov. 29:18 from two versions and then, without even dealing with the important meaning of the word “vision,” he then proceeded throughout the book using the dated definition of the word. Much is made of establishing a “vision statement” as a guiding light for a man’s ministry. Though I agree that we need goals, this was more like something from Robert Schuller’s visionary approach to creating your own future. The example vision statements were basically, “Here’s what I really want to do in this church.” Statements like “To know Him and to make Him known” and “Win the lost at any cost” were negatives. Barna also pushes targeting a segment of society. Most of the examples were of reaching the upwardly mobile unchurched. I do not see a biblical basis for this approach (cp the Philippian Church). I think it is a selfish way of only dealing with people you find attractive. The whole thrust of a N.T. church is to span those differences together. Don’t pay the $16.